Online Registration for the Vancouver Rocky Mountain Soap Women's Run & Walk is now open! Keep an eye on our Facebook Page and watch for e-newsletters with further announcements. 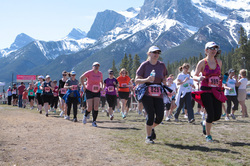 The Rocky Mountain Soap Women's Run & Walk was originally started in 2008 in Canmore with 600 participants, and has since grown to attract over 2,600 women for an active weekend getaway. A highlight of the season for many runners, this event has historically sold out within the first month of registration being opened! We thought is was time to expand our offering to another great running community - Vancouver! With beautiful tree canopies, sparkling water, mountain views, and pleasant temperatures, Vancouver is the ideal setting for many outdoor activities. What: 5 km and 10km Run & Walk, Half Marathon, and the Fast and Female Girls' Run! How Much: $60 for both the 5km and 10km distances, $85 for the Half Marathon. This registration fee includes $50 in Rocky Mountain Soap product, a nutritious post-race snack, a health and wellness expo and much more! If you register BEFORE JUNE 30, you will also receive a fabulous race t-shirt with your registration! Why: The Rocky Mountain Soap Women's Run raises funds and awareness for Fast and Female. Click here if you and your running friends would like to raise extra funds for this great cause!